This is a story about regaining power, becoming your own person and accountability. There’s also an underlying theme of sacrifice and doing what’s right even when it doesn't feel good. Katsa starts as powerful but powerless. She’s manipulated by her uncle and forced to do what he orders, but she’s also powerless because of how she perceives herself. She feels like a monster, therefore she acts like one. But progressively she starts to change. First, she creates the Council as a way to right the world’s wrongs, and as a way of rebelling against the oppressive power of her uncle. With a bit of help from Po, she realizes that her version of herself doesn't have to match the reality, and that she has the means to change what nature and circumstances made of her. She goes from everything happening to her, to someone who makes thing happen and takes action. There’s a clearly defined character arc, and by the end of the book she’s a different person. The romance is an important part of the story, but it’s almost subdued and it feels more secondary than it really is. The relationship between Po and Katsa was romantic and sweet. He admires and supports hers. They are partners who love and complement each other, something that becomes obvious at the end of the book. I was worried that she had all the power in the relationship, but that’s not the case. And even if it were, it’s interesting to see a romance where the heroine is the one who holds the power, especially a Fantasy YA. The theme of gaining control over your own body and life is also woven into the romance. Katsa doesn't want to get married. At first she doesn't think she would make a good wife, and when she finally breaks free of her uncle and becomes her own person, she hates the idea of belonging to someone else. She never changes her mind because independence means everything to her. The romance works around this, and does it in a very successful way. The premise and world-building were great. I think one of the reasons why it works is that the world is fairly simple, and the gracelings are the only fantastic element, but because the whole story revolves around them, there’s no way for it to feel confusing or overly complicated. The story flows at an excellent pace, there’s no info-dumping and the tension builds progressively. Ms. Cashore is a wonderful storyteller and I’m amazed by the quality of this book. Graceling isn't perfect, though, and its biggest flaw is the villain. I can’t say much about him, because he’s not as obvious as it may seem, but I think what makes him the weakest link is his lack of motivation. He’s evil for the sake of it, and when compared to interesting, complex characters like Katsa and Po, he comes across as cartoonish and lacking. It doesn't help that we almost never see him, and I think that Ms. Cashore wrote herself into a corner when she gave him so much power. The story is told in third person but always from Katsa’s POV, so she has to be with the villain for us to see him. But the problem is that she can’t be with him for different reasons that I won’t mention here, so all we know about him is that he’s very bad. The final confrontation was rushed and anticlimactic. It came out of nowhere and it left me wanting more. But it fit the story and it made sense. I don’t think an epic battle was possible given the circumstances. And to be honest, the real conflict doesn't come from the villain, it comes from within the main characters, and they do get a good ending. In case you couldn't tell, I loved this book. I’m glad it took me so long to read it because now I get to glom the whole series and I don’t have to wait. If you haven’t read it, I highly recommend it. There are many great details that I can’t mention here because the review is already long, but I think the details are what make the book great. Note: this is a series, but each book features a different set of characters. 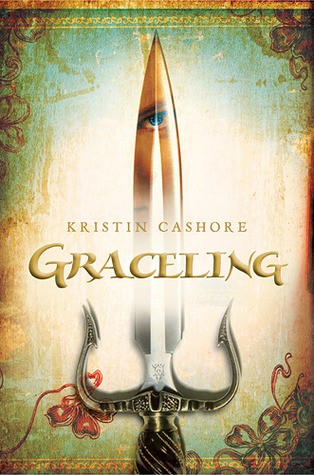 I think the three books are loosely related, so Graceling has a HEA, albeit a non-traditional one. Don't worry about cliffhangers and series that never end. In a world where people born with an extreme skill - called a Grace - are feared and exploited, Katsa carries the burden of the skill even shedespises: the Grace of killing. She lives under the command of her uncle Randa, King of the Middluns, and is expected to execute his dirty work, punishing and torturing anyone who displeases him. I've been debating reading this - everyone seems to just LOVE it, but for some reason I've been hesitant. Last week, I grabbed a copy at my library, although it's just sat on my shelf - after your review? I'm going to grab it this afternoon and start reading ASAP! Yay! Good to know I'm not the only one who's late to this party. Let me know how you like it. I hope you enjoy it just as much as I did. Oh, GRACELING. What a lovely review, Brie. I'm delighted you got around to this book and series. Just wait until you read FIRE. It's unfathomably good. Thank you! I think I'm going to wait until the holiday break to read Fire and Bitterblue. I'm hoarding books so I have a productive, enjoyable Christmas ;-) But unfathomably good makes me want to read it right now! Amazing book. Fire is EVEN BETTER. Enjoy! I'm glad to hear that. Can't wait to read Fire! I LOVED THIS BOOK! Seriously one of my favorites of the year. I loved Katsa's and Prince Po's strength, and their unconventional romance was so sweet. It just worked with both of them being who they were. I agree with you about the ending. But thankfully it took nothing away from the book and the story for me. Did you read it this year? Po was awesome, right? Such a wonderful hero. I think YA has us used to bad boys and crazy heroes, so he was a pleasant surprise. It truly is a gem, and when you feel in the mood, give it a try because I'm sure you're going to like it. I really liked this book-I picked it up after seeing it mentioned a few times around the blogosphere so I didn't really have expectations but I loved it! It's definitely my favorite of the three; I will be interested to see your thoughts on the others. I keep hearing many good things about this book, so I think that it's time for me to pick up a copy. I love the idea of gracelings with particular gifts. The fact that Katsa is so busy with independence really attracts me to read this book. I like it when a heroin can survive alone - and I love the sound of her romance with Po! :) It's a shame that the villian isn't as good as the rest of the book, but I know that I will enjoy this book. Awesome review.